Cyprus. Girolamo Priuli. 1559 to 1567. Reference : I don't have a good reference on these. Size : 13.2 x 13.4 mm. Weight : 0.46 grams. Grade : F but over cleaned and very slightly rough. 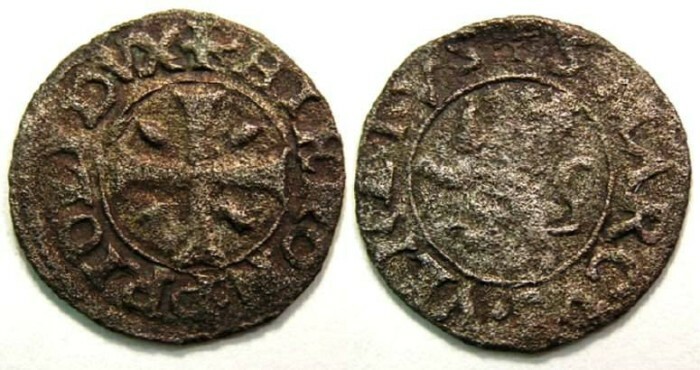 Obverse : Short cross with a egg shaped mark in each quarter, with GERON PRIOLI DVX around. Reverse : Lion of Cyprus rampart left with S MARCVS VENITVS (a few letters are weak but all can be read).